It doesn't leave wet residue behind. And thanks to the powerful motor, it takes little time to heat the water in its large tank. The sound of pressured steam may be rather loud. 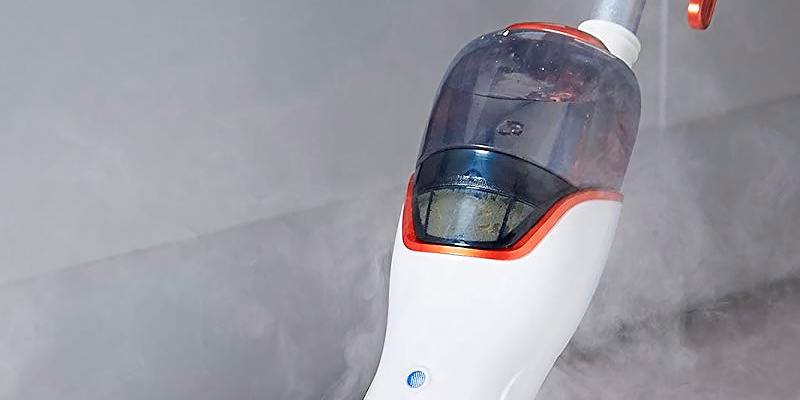 This sleek-looking steamer is a perfect pick for those who are serious about steam cleaning. It's a heavy-duty cleaner that comes with a huge variety of extra accessories to clean your house from the bottom to the top. Numerous accessories can be attached to this steam mop, allowing you to clean every area of your house or office: carpets, floors, windows, grout, ovens, upholstery, etc. The SKG 1500W is a great multipurpose steamer for cleaning and sanitizing various surfaces. It's a professional model that can be used for both home and commercial facilities. The set includes a snap-on glider to refresh carpets and an extra microfiber pad. Both of them are machine-washable up to 25 times. The mop might leave some stains. This is an excellent entry-level steamer. Boasting quick start, steam feed control, and triangle attachment, it will turn cleaning into a breeze, saving your money and time. This carpet steam cleaner comes supplied with 15 extra accessories for cleaning almost any surface. The steam sound may be piercing if used on tile floors/wall in small rooms. 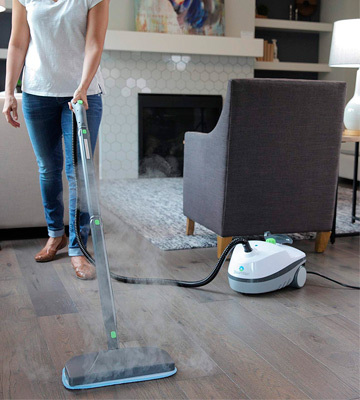 The Steamfast SF-370WH is a wonderful fully-versatile steam cleaner that can blast away tough dirt and grime from any surface all around your house. The triangle mop head can rotate up to 180 degrees, which makes it very maneuverable and allows you to get into all corners and crevices. 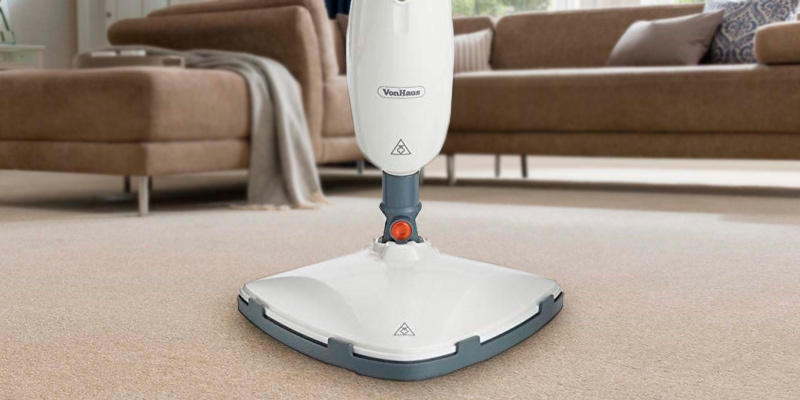 The VonHaus steam mop can easily clean and disinfect both hard floors and carpets. And a special light indicator will notify you when the appliance is ready for use. Easy to operate, easy to clean! 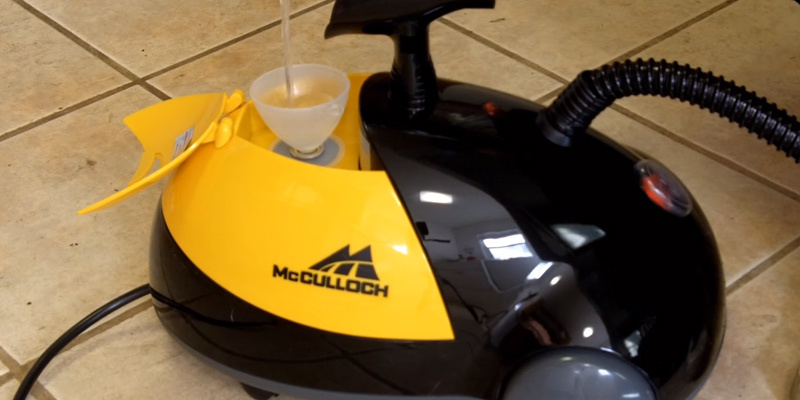 The McCulloch floor steam cleaner is a real beast on the market of household appliances. It is designed to deliver customers the superior cleaning performance and it will be an amazing choice for owners of large houses or apartments who often deal with lots of cleaning. This professional cleaner produces really hot steam that can remove even the most stubborn dirt and grease from any surface. The appliance will enable you to disinfect your whole kitchen or bathroom in the twinkle of an eye. Moreover, it will easily dissipate various unpleasant odors from your clothes or furniture. 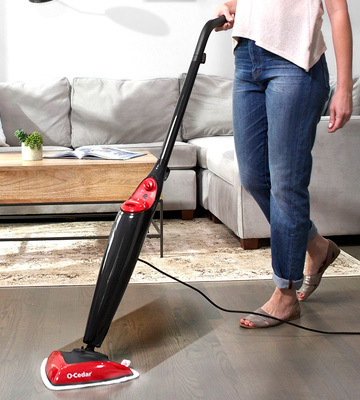 In a word, this steam cleaner can perform a deep tidying of the overwhelming majority of flooring surfaces, household appliances, countertops, etc. It can remove bed bugs from your linen, disinfect your furniture, and of course, freshen up your old carpets. And these aren't all the uses of this sleek-looking machine. It can do just everything. Keep on reading and discover! Considering the technical characteristics of this device, we can emphasize that with the powerful motor and 48-oz water tank, the steamer delivers you 45 minutes of continuous steaming. And if you use the steam wisely, it will be even possible to further prolong your cleaning session. The cleaner gets ready in 8 minutes and produces constant steam at 43 PSI pressure. The steam gets hot up to 200 degrees F and, naturally, can crush tough grease, dirt, and other grime. 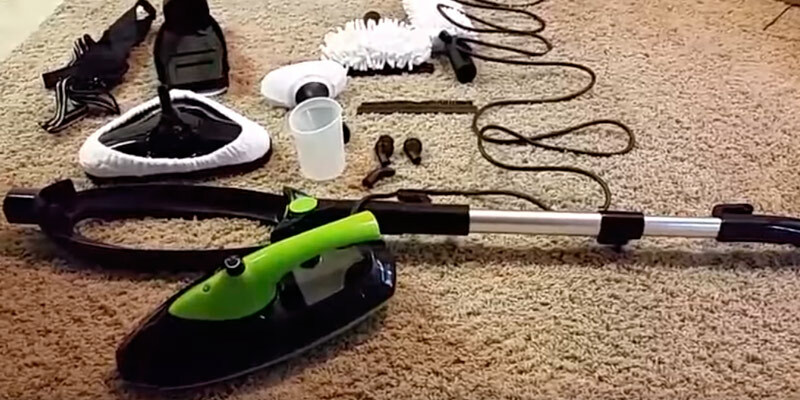 This steam cleaner wouldn't be so versatile without the extra attachments it comes with. Its bunch of additional accessories is probably one of the largest out there. The set includes as many as 18 different accessories which are useful for sanitizing a wide variety of surfaces. For instance, a floor mop attachment is good for use on all sealed flooring surfaces, while utility brushes can tackle the toughest grime on ovens, BBQ grills, and more. Since the device has a long power cord, you will be able to move the cleaner around without a need to plug it into different power outlets too frequently. And owing to a wide cleaning path, this appliance will let you tidy up your home fast and efficiently. The SKG 212F Hot Steam Mop is a multifunctional steam cleaner that is likely to meet all your cleaning requirements. It comes with a powerful 1500-Watt steam generator and a water tank with the 7.6 fl oz capacity. Just with one easy turn of the knob on the handle, the steam power can change from Min to Max so that you could use the mop on different types of surfaces. What we liked the most about this portable carpet steamer is that it comes with a lot of different attachments. It's supplied with 6-in-1 useful accessories which can be used for cleaning not only floors but various surfaces in your kitchen, bathroom, and car as well. In addition to this, the steam mop comes with 3 washable microfiber pads that can be easily washed, hence, you won’t need to buy replacements that often. We would like to mention that this cleaner can also be transformed into a hand steamer. 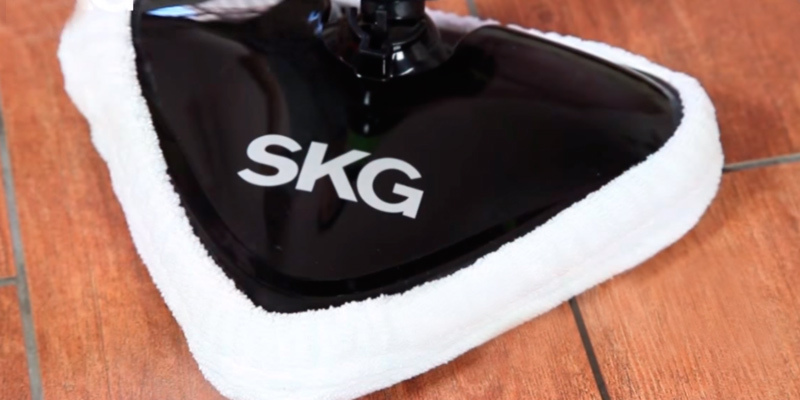 So, with all that in mind, let’s now discuss the actual performance of this super versatile SKG mop. Due to the fact that the mop head can rotate 180 degrees, it takes no effort to reach and clean even the most hard-to-get places in a room. Even though the product is a bit heavier than other similar steamers, it's pretty easy to carry around thanks to the well-thought handle. 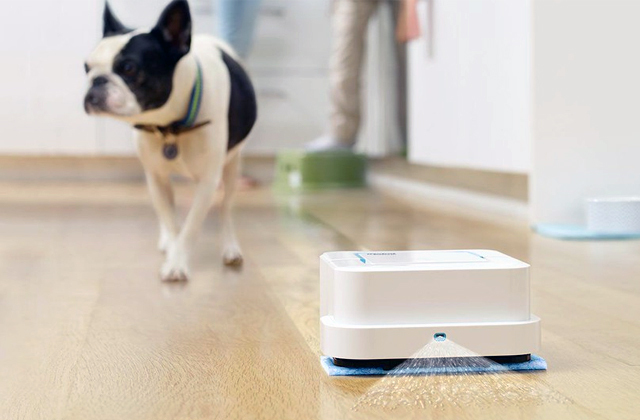 Owing to the natural steam power, this device flawlessly dissolves the dirt with all the germs from all kinds of bare floors. 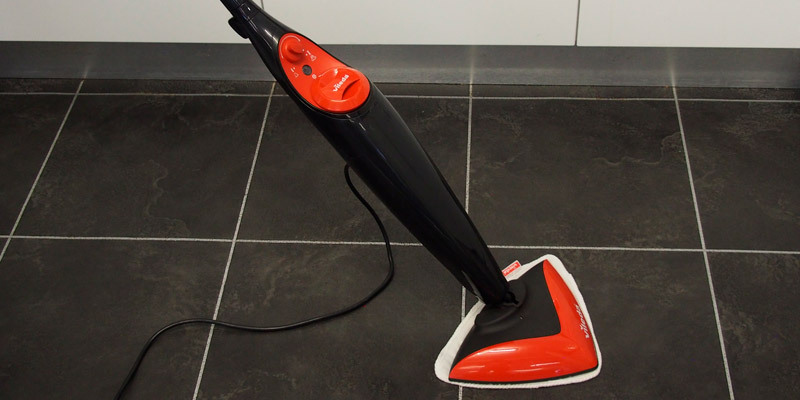 Moreover, apart from laminate, vinyl, tiles and hard floors, the steamer can also be used to clean carpets, upholstery, bathroom and kitchen taps, ovens, sinks, and windows. Since it doesn’t require any harsh cleaning products, it creates a non-toxic environment in your house or office. Last but not least, let’s have a look at usability. 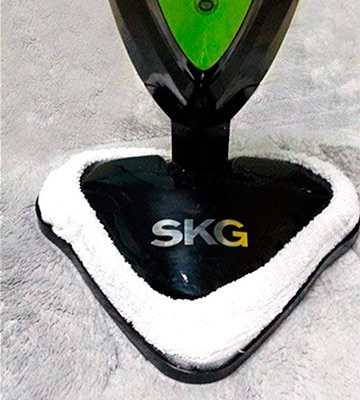 The SKG mop is a powerful tool that can make the steam temperature go up to 212 degrees F. And with the steam control adjustment, you can choose Min or Low level for cleaning sensitive surfaces and High or Max for dealing with the toughest messes on hard floors. 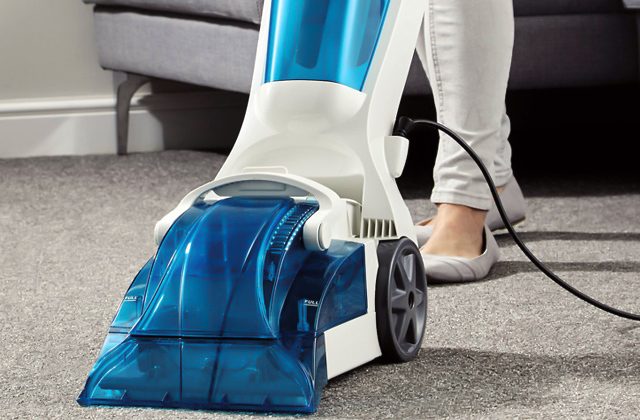 Moreover, fitted with a special snap-on glider, the cleaner allows you to deep clean and deodorize your carpets and rugs. The cable length is approximately 25 ft, which is more than enough to move around the house without an extension cord. Overall, this product can become a great helper in your house. For sure, the cleaning process will no longer take you too much effort and time. 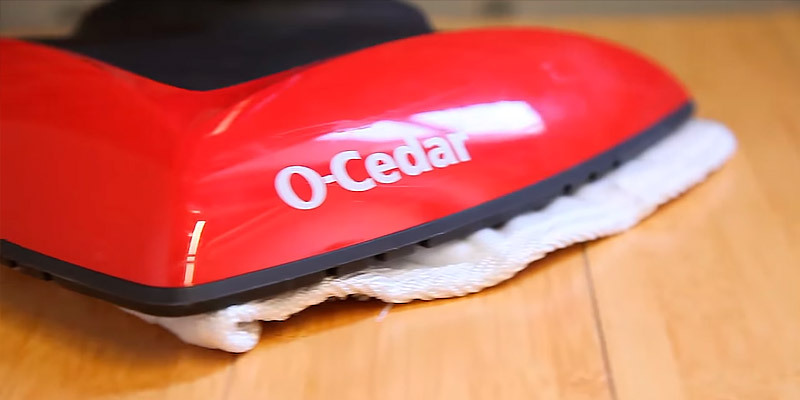 The O-Cedar Microfiber Steam Mop is a great entry-level steamer that's extremely lightweight, easy to use, and cleans without having to push down on it. It consists of 3 main parts - a comfy handle, a compact water tank, and a swiveling mop head. The body contains the steam generator of 1550 Watts and the water reservoir with 13 fl oz capacity. The water tank is pretty compact, and no wonder that the mop gets ready to work in incredible 20 seconds. And thanks to the LED light indicator on the tank housing, you'll know for sure when you can start steaming. The steamer features the On/Off button and a selector switch for steam adjustment. The mop head has a triangular shape and can swing for effective access to corners, crevices, or around the furniture. Although it's a very reasonably-priced rug steam cleaner, it's one of the most powerful models on the market. 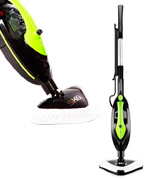 The high performance of this steam mop is provided by its efficient steam generator. 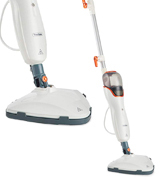 Owing to the 1550-Watt motor, the mop will easily cope with any deep-set dirt and stains. And thanks to the snap-on carpet glider, it'll not only disinfect but also freshen your carpets. 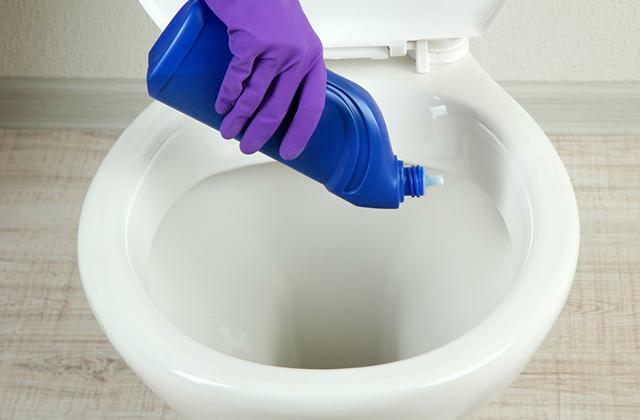 The tank capacity is not that high, yet it's sufficient for cleaning a medium-sized room. And the long power cord will allow you to reach every corner without a need to change a power outlet. 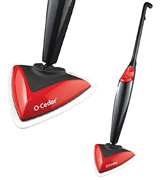 This upright steam cleaner comes with 2 microfiber pads that let the steam go through evenly. Then they absorb water fairly quickly and, consequently, your floors dry faster. Additionally, the package includes the special carpet glider for cleaning rugs and floor mats. 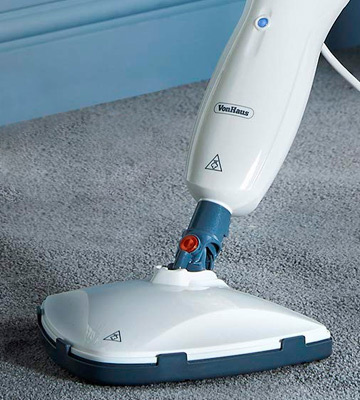 The simple design of this portable carpet steamer ensures the ease and comfort in handling. The handle can be quickly coupled with the tank housing - you just need to slide it in until it's fixed appropriately. 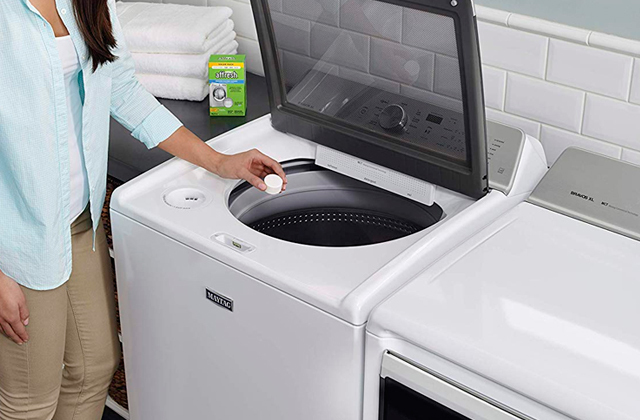 Once the cleaning is completed, you can detach the handle by pressing a special release button for convenient storage. As a nice touch, the measuring cup is included in the set. It will make filling the tank much easier. The last thing we would like to note is that the microfiber pads are reusable. You can launder them in your washing machine and they will be ready for the next use. They are machine-washable up to 25 times. 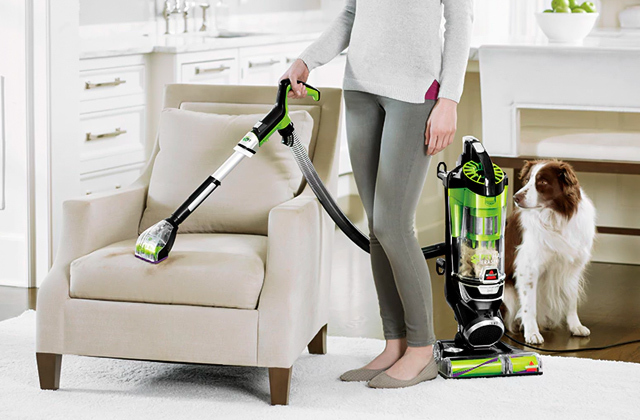 The Steamfast SF-370 WH carpet steam cleaner looks a bit similar to a conventional canister vacuum cleaner, yet it's much more powerful and functional. It's a one-of-a-kind compact vapor steam cleaner model. Many users appreciate this cleaner as it's much lighter than other popular steamers on the market. However, this compact design doesn't affect its productivity. And you'll not have to keep the whole device in your hands to perform a cleaning session, just a wand. The steamer is able to clean just anything from the bottom to the top. It will provide you with an opportunity to clean walls and floors, windows and mirrors. Moreover, it can also clean your children's toys and even brush the grease from your microwave oven. 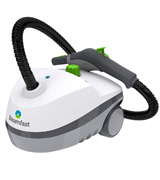 The opportunities are endless with this multi-purpose Steamfast cleaner. Despite being a very compact appliance, the power capacity of this steam cleaner makes as many 1500 Watts. Thus, it can heat water up to HOT 200 degrees F within 8 minutes. Of course, it's not the quickest heating time, but considering how capacious this model is, it's quite OK. An extremely-large water tank will be enough for a long 45-minute cleaning session. So, you can get a wonderful opportunity to deep clean almost all surfaces in your house per one go. We would like to emphasize that the device maintains a pressure of about 43 PSI. This pressure will be sufficient to remove stubborn stains from furniture or carpets. Furthermore, the steamer effectively disinfects all kinds of surfaces in your house, hence making your environment a bit healthier. This multi-functional steamer is equipped with a generous bunch of extra accessories. 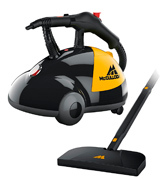 To be more precise, the package includes 15 accessories for all kinds of cleaning tasks. Numerous brushes, pads, and nozzles allow you to clean floors, tiles, countertops, upholstery, grills, sinks, toilets, and much more. For example, such an accessory as a jet nozzle helps erase stains from your carpets or furniture, while brass-coated brushes are appropriate for removing the toughest grease and grime from different surfaces. And, finally, it should be mentioned that a steam hose is isolated and remains cool during your cleaning sessions. In general, this device will be very useful for performing any domestic job. This little steam mop cleaner by VonHaus really shines in its ease of use. It makes cleaning and maneuvering around the furniture a breeze. The secret lies in its compact and lightweight design with a pivoting head. The triangular mop head can swivel up to 180°, thus allowing you to reach tight corners and any other hard-to-get areas. This way, the steamer will leave no place for germs to hide. 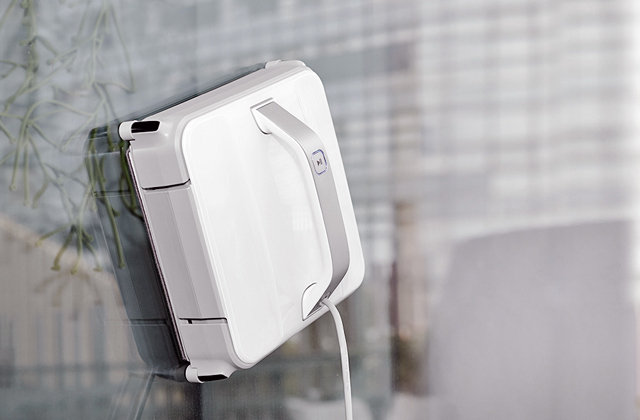 Thanks to the generous 16-foot power cord, you'll be able to sanitize your whole room without stops for switching a power outlet. And since the detachable water tank has a large 18.5 fl oz capacity, you don't need to worry that you might run out of steam during the cleaning process. As for the controls, this rug steam cleaner has only an On/Off switch and a "ready" indicator. It's extremely easy to use and navigate. 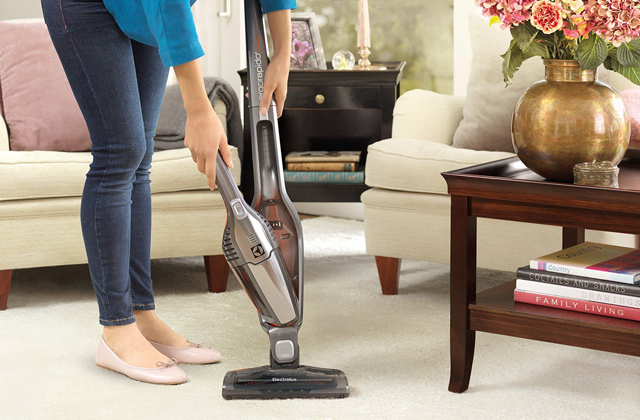 We can safely say that it's a stellar option for those looking for their first carpet steamer. This VonHaus Upright Steam Mop boasts 1200 Watts of power. And after you plug in the unit and turn it on, it'll need just 30 seconds to get ready to use. Although the water tank is fairly large, the water preheats to required temperature extremely fast, providing you with hot steam for 20 minutes continuously. 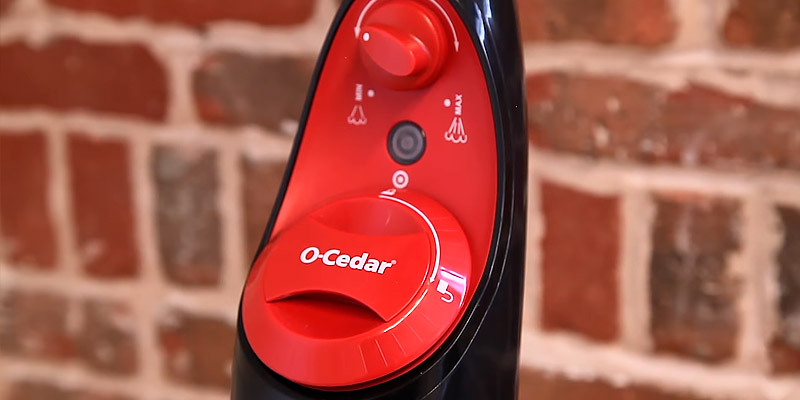 Producing 1 bar of pressure, this steamer removes up to 99% of bacteria, allergens, and germs. 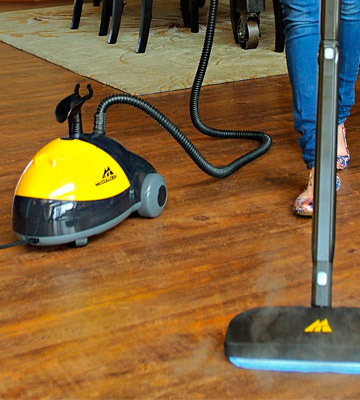 This powerful steam can effectively cut through grease and grime both on carpets and hard floors. It ensures amazing performance on wood, laminate, linoleum, tiles, and vinyl coverings. As you see, it's good not only for carpets and rugs. 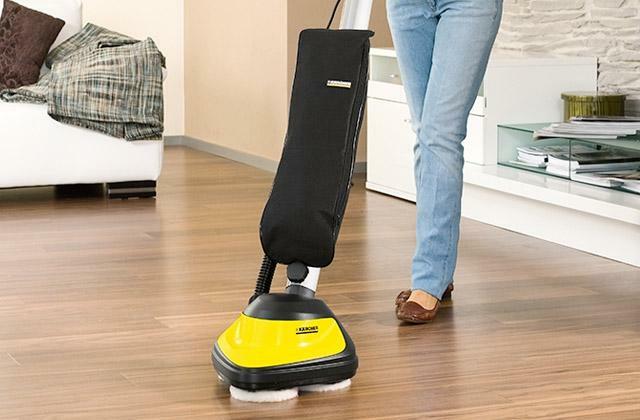 This steam cleaner comes packed with two removable and machine-washable microfiber pads - for floors and for carpets. Both of them ensure smooth and easy gliding when cleaning. They are made of ultra-absorbent microfiber to freshen-up carpets and sanitize hard floors. 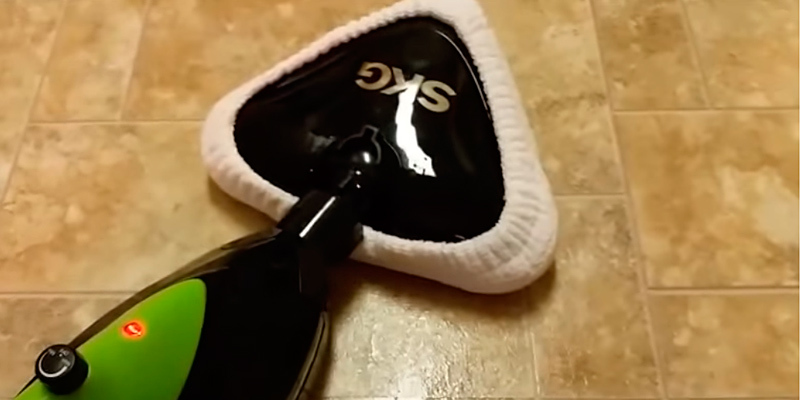 The mop pads are easy to attach/detach using a reliable Velcro. As the pads are machine-washable, they can be used for quite a long time without replacement. Yet, it's always a good idea to keep spares. For this reason, the VonHaus company kindly offers you a set of two replacement pads for less than $8. 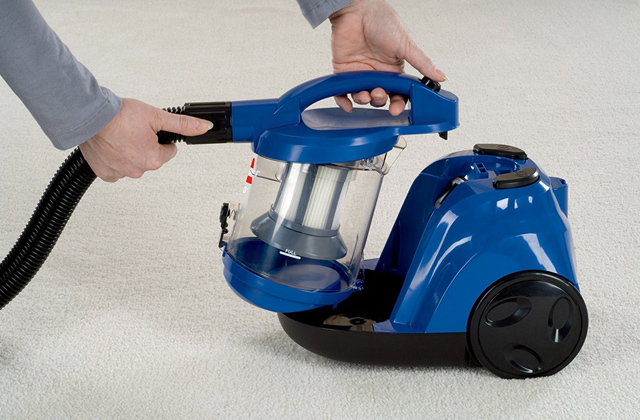 What Is a Carpet Steamer? There are numerous benefits of steam cleaning among which are removing stubborn grease and disinfecting various surfaces. A carpet steamers can help you get rid of such harmful bacteria as listeria, e-coli, and salmonella, to name but a few. And the best part is that the steam cleaning is a green alternative to using chemicals. It's not less effective but far more environmentally-friendly. 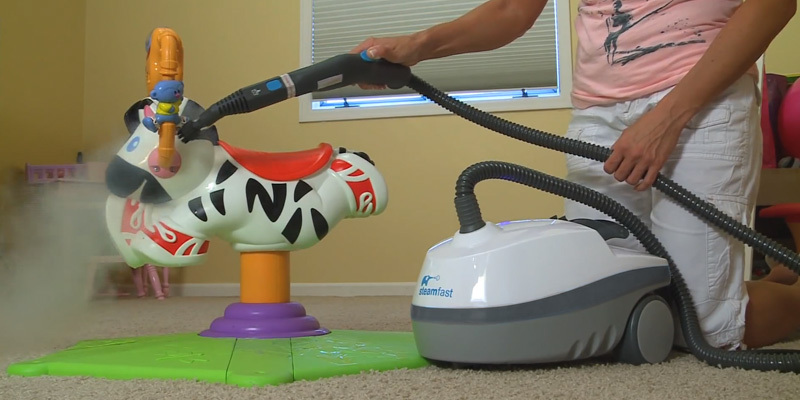 Steam cleaners don't leave a toxic residue that could be very harmful to pets and children. Also, they are great for those who suffer from allergy as steamers kill bed bugs, mites and other creepy crawlies that might trigger allergic reactions. 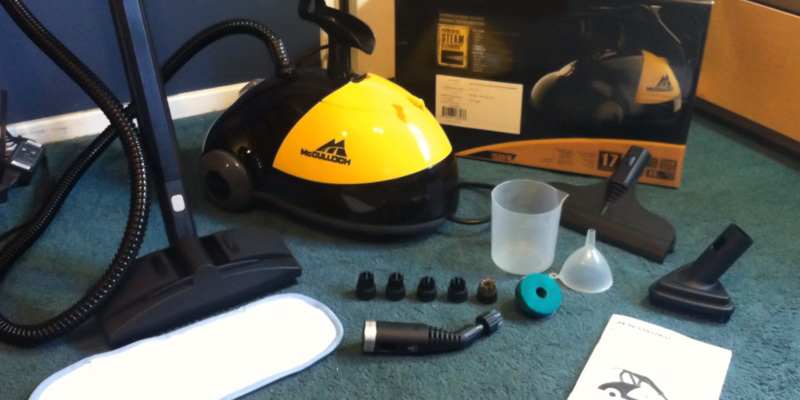 So, how do steam cleaners work? Any type of steamer has a water tank and a heating element that boil the water to the high temperature, thus creating steam. And the heat of the steam melts away dirt and germs. Steam cleaners have various uses around a house, garden, and a car. So, if you want to keep your environment clean and green, a steamer is a must-have thing in your household. 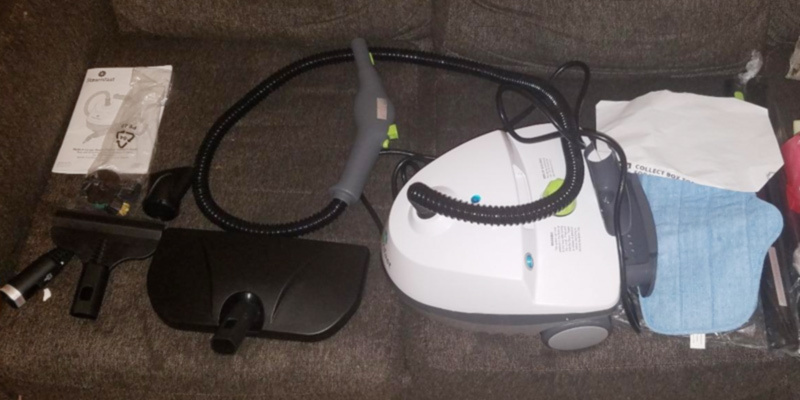 And if you're not sure what type of steamer you really need, we kindly propose you to look through the review on handheld steam cleaners as well. First of all, you need to decide on what for you are going to use a steamer. Basically, there are two main types of carpet steamers: a steam mop and a cylinder vacuum cleaner. Steam mops look a bit similar to upright stick vacuums, yet they are usually much more maneuverable. They have swiveling heads and can easily get into corners, crevices, and other hard-to-reach places. They are excellent for floor and carpet cleaning, however, they are not that effective for other surfaces. They aren't the best option for counters, corners, ovens, grills, etc. Steam mops have a water tank which is either fitted inside a unit or attached to a handle. Yet, it's not very capacious and can last for 15-30 minutes only. On the positive side, the heating time is very quick and, thus, you can start cleaning in less than 1 minute after switching the unit on. As for cylinder steam cleaners, they are a little bulkier but far more versatile. The larger size means the larger water tank, and no wonder they can produce hot steam up to an hour continuously. 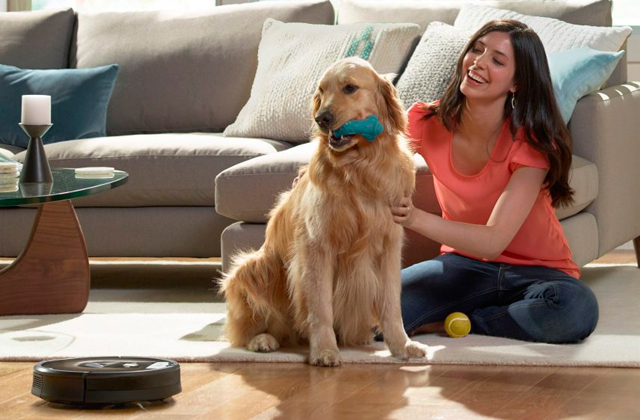 They allow you to perform larger cleaning jobs and clean all surfaces in your home per one go. 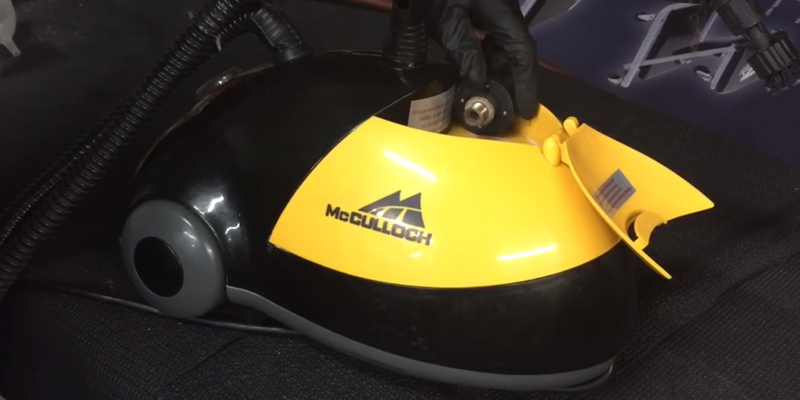 This type of steam cleaners typically comes with numerous attachments for deep-cleaning different surfaces. They are good for sanitizing not only rooms but kitchens and bathrooms as well. Heating time, water reservoir capacity, and pressure are other very important characteristics that should be taken into account. As we have already mentioned, steam mops require less time to get ready but they are less capacious and might require refills if you're going to clean your whole house. However, the heating time and runtime varies from model to model. The same goes for cylinder steam cleaners. Typically, they need 7-10 min to get ready and can produce steam continuously for 40-60 minutes. That all depends on a water tank capacity. The more the volume, the longer the runtime. Vapor pressure is also an important characteristic which defines the type of contaminants the device can tackle. The appliances with low pressure are good for deep-cleaning of windows, doors, and floors, while those with 40+ PSI pressure will be optimal for removing the toughest grime and grease from stovetops, BBQs, etc. 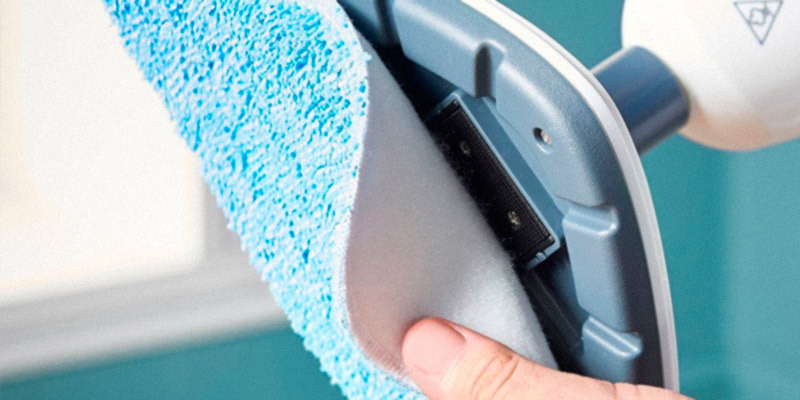 Additional nozzles, brushes, microfiber pads, and other accessories that come with a steamer determine what the device can clean and how convenient it is. 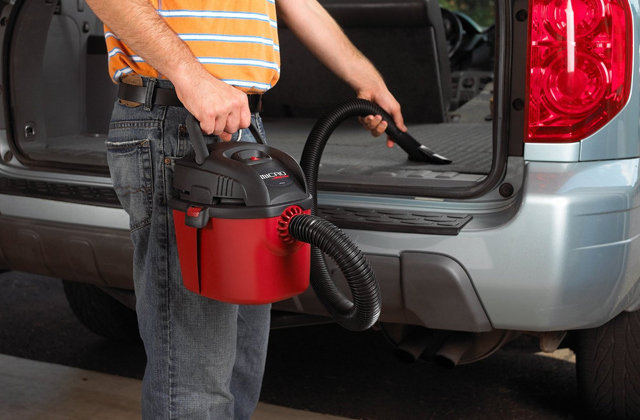 You'll be able to clean furniture, toys, and even the interior of your car with the help of special attachments. Brush accessories are great for ceramics and tiles. Accessories with terry cloth are perfect for window/mirror cleaning. In the early 19th, people began to create different ways of how to clean their carpets manually, and some of them were really effective though time-consuming. For example, in the 1830s, housewives tried to remove ink, grease, and oil by scrubbing their carpets with lemon juice and even a hot loaf of bread. Over time, some of them began using straw brooms in order to preserve a carpet’s color. Ives W. McGaffey designed the “Whirlwind,” first vacuum cleaner, in 1868. Soon after, many inventors introduced other manually-operated vacs, but all of them were bulky and difficult to operate. And only in 1898, John S. Thurman patented the first powered "pneumatic carpet renovator" that blew dust into a container. Yet, the first electrically-powered “carpet sweeper” was invented in 1900 by Corrine Dufour. And already in 1901, Hubert Cecil Booth and David T. Kenney created the powered vacuum cleaner. However, many families couldn't afford those appliances and used different manual ways to restore their carpets. They mixed clay paste with water and applied this solution to their carpets, and some people substituted clay paste with chloroform that wasn't good for human health. Steam can not only keep your carpets in top-notch condition but also make your living environment healthier. The high-heat steam eliminates dirt, dust, and oils from surfaces as well as removes some nasty things that lurk in your carpet. It kills dust mites, bacteria, allergens, and germs that tend to collect in carpets. This means that steam cleaner leaves your carpets deep-cleaned and sanitized. Moreover, by performing steam cleaning, you eliminate greasy residue that attracts new dirt, thus reducing the frequency of vacuuming. We recommend you to steam clean about twice a year. But if you have kids, pets or those suffering from allergy, you might need to do it more often. To steam clean a large carpet, we recommend you to remove all the furniture and clutter from the room. If you can't move your furniture to another room, you can just move it to the other section of the room, and then perform the cleaning section-by-section. Next, dust the baseboards as you might knock the dust off while running a steam cleaner over them. 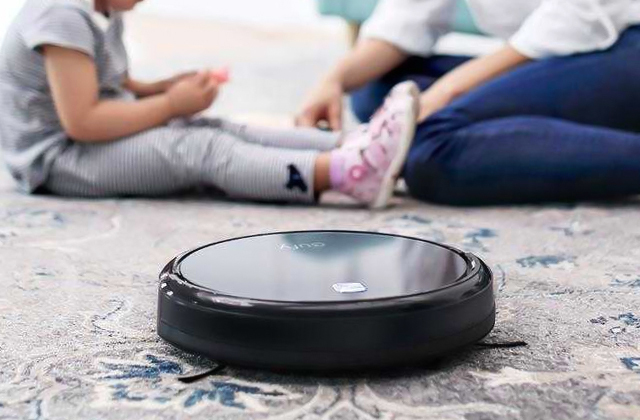 Also, you should pre-vacuum your carpet as steam cleaners are intended mainly for small deep-set dirt particles and they are unable to remove hair and large dirt. If you notice set-in stains in your carpet, it's a good idea to treat them with a stain remover beforehand.